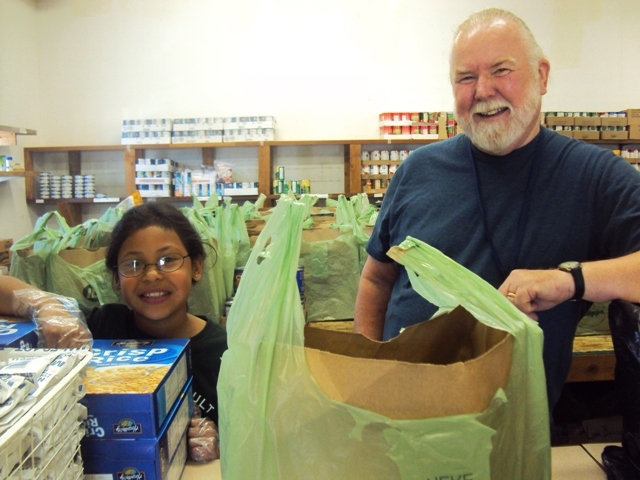 Our friends Barb and Mike are volunteers at the Ocean Shores Food Bank. So I asked if I could take Seneca to see it as we like to contribute to this project. I checked to be sure we visited at a time that was likely to be quiet. Barb greets people as they arrive and enters information into a computer to keep a record of how many people are provided food. 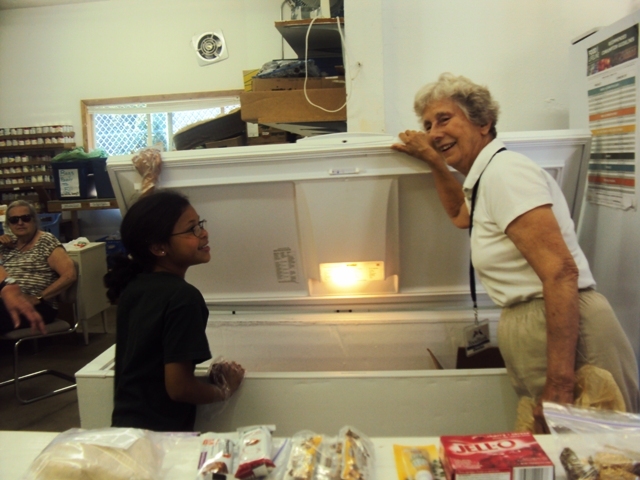 She greets each visitor with kindness and respect and answers their questions. They then go to the window where Mike asks a couple of questions, “Would you like canned stew or chili?” They are then handed a brown paper sack which contains some canned food, sugar, cereal and other staples available that day. 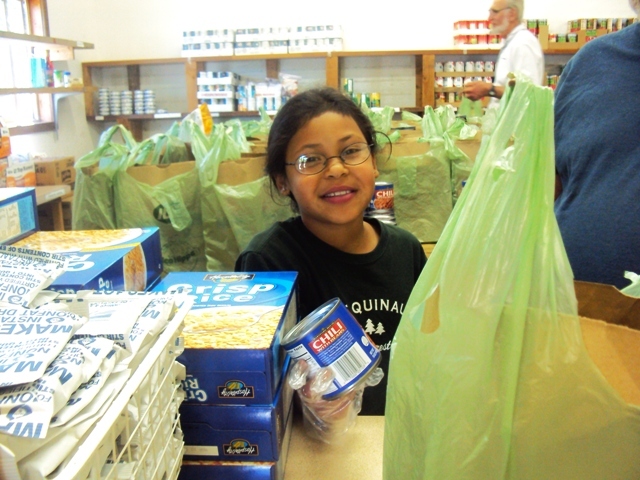 They choose their own rice or pasta, then move on to the frozen meat, fruit and vegetables, and bread. 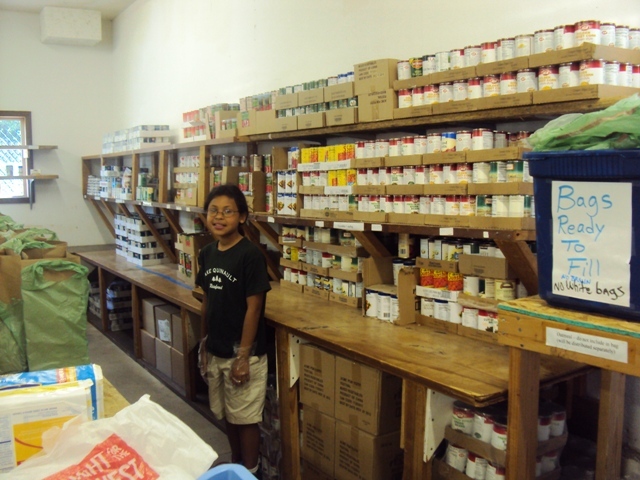 Volunteers stand ready to help them load the food into their vehicles. All of this made quite an impression on Seneca. 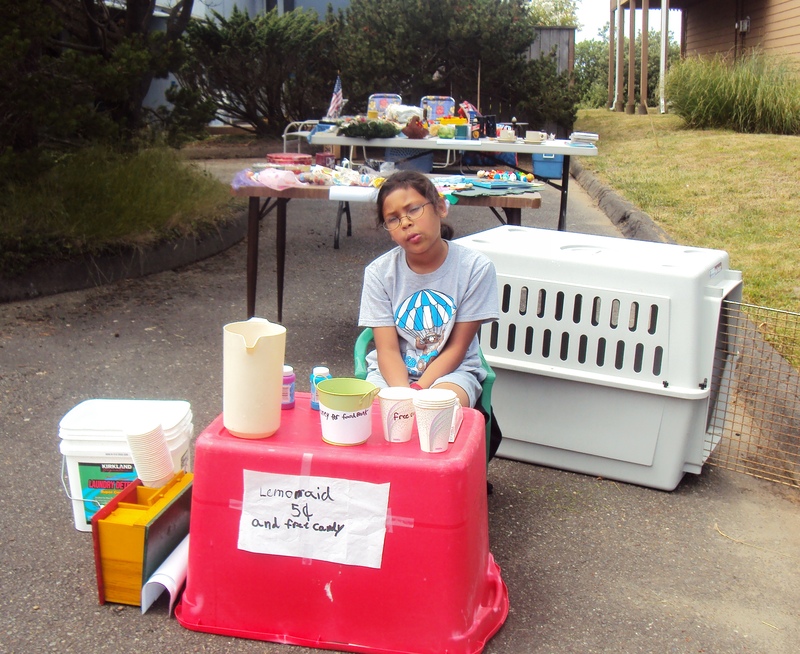 On the weekend we had a Yard Sale at our house. 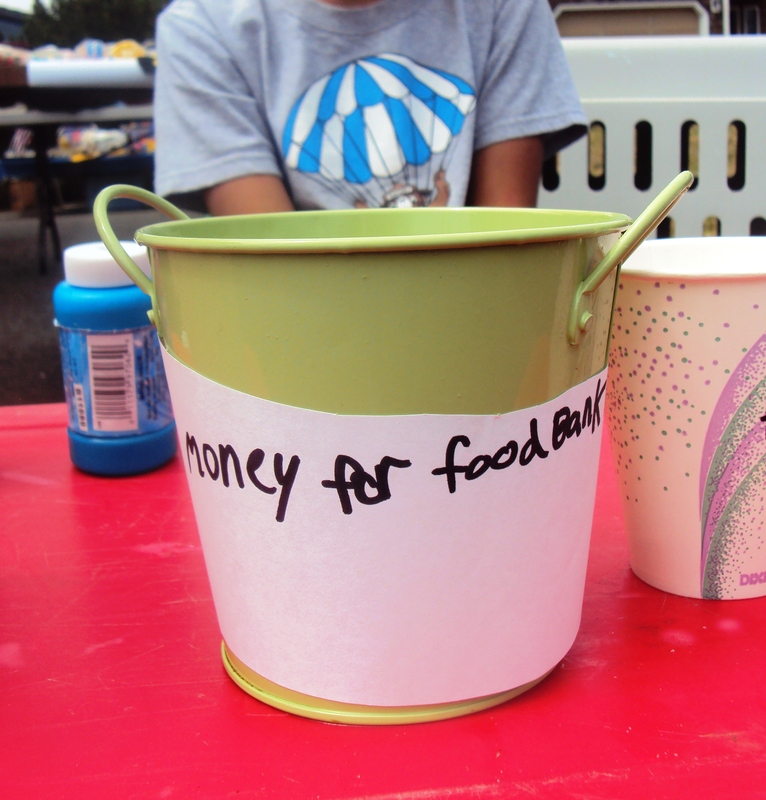 Seneca set up a lemonade stand and she asked everyone who stopped if they would like to donate to the Food Bank. That evening she had $8.13 to contribute. 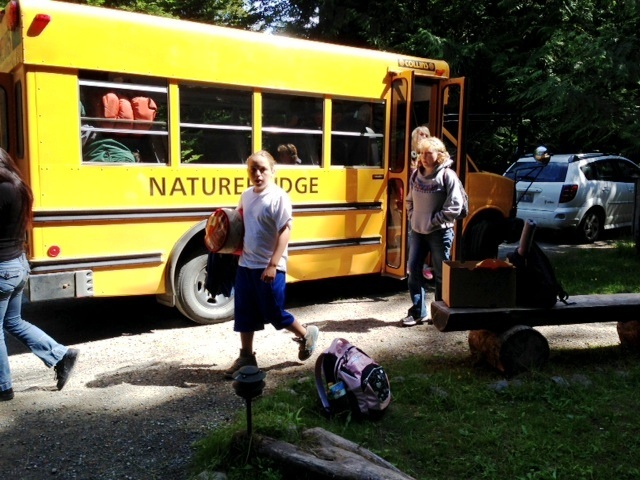 For the past couple of years our family has taken foster children on an emergency basis. This generally means children arrive a few minutes to a couple of hours after we receive the call, and they usually aren’t here for long. Last week, however, we were asked take two little ones with a whole week of notice. I decided it would be a good idea to give myself a few days off to finish some sewing projects and to rest before their arrival. I finished a doll quilt. I belong to an internet doll club and each month we have a contest and it is mine turn to provide a prize next month. This is a simple red and white quilt and is hand quilted. Doll Quilt, green outline is carpet, not part of the quilt! Our family is involved in a World Wide Swap and we are preparing packages to send to families in New Zealand, Russia, Alberta, and Kansas. The packages contents must relate to our local area. 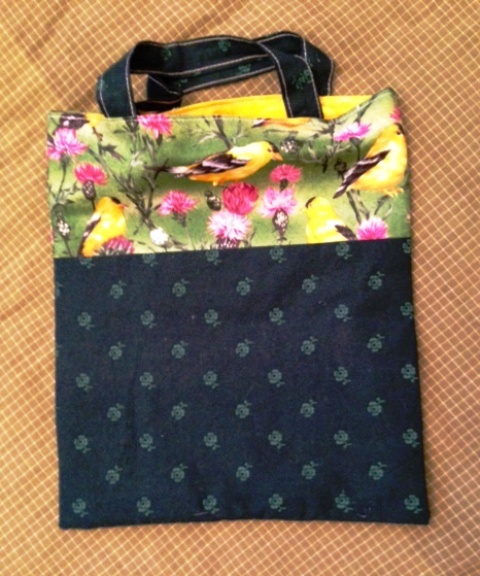 I sewed little bags decorated with Gold Finches, the state bird of Washington. We are including agates from our beach. 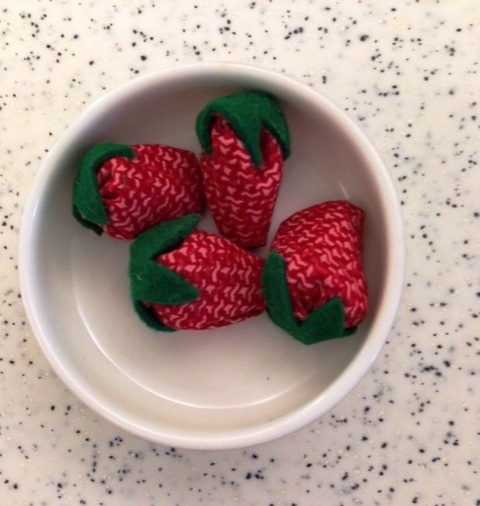 We grow lots of strawberries in this area and I decided to create some little strawberries to include in the packages. 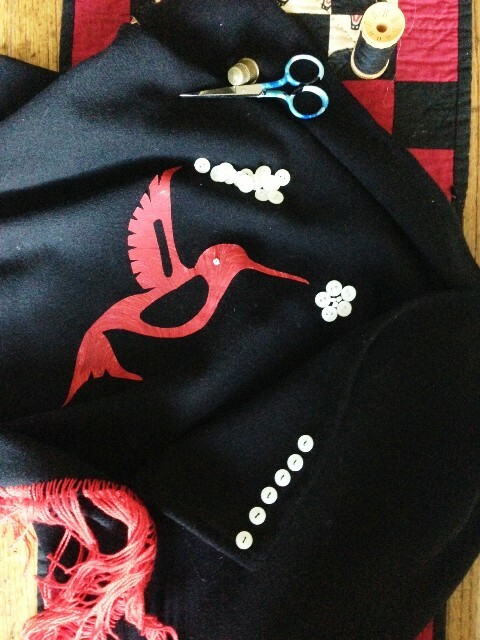 Raven and Seneca will be drumming, dancing and singing in ceremonies for the Canoe Journey later this month, and I added buttons to Seneca’s regalia. 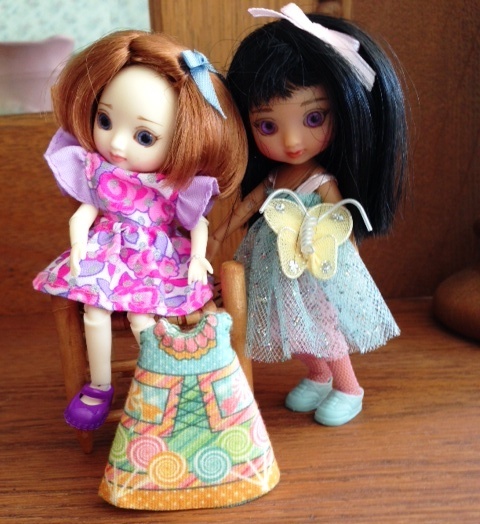 I have two new little dolls, 4.5 inches tall and I am making some dresses for them. This one isn’t quite finished. 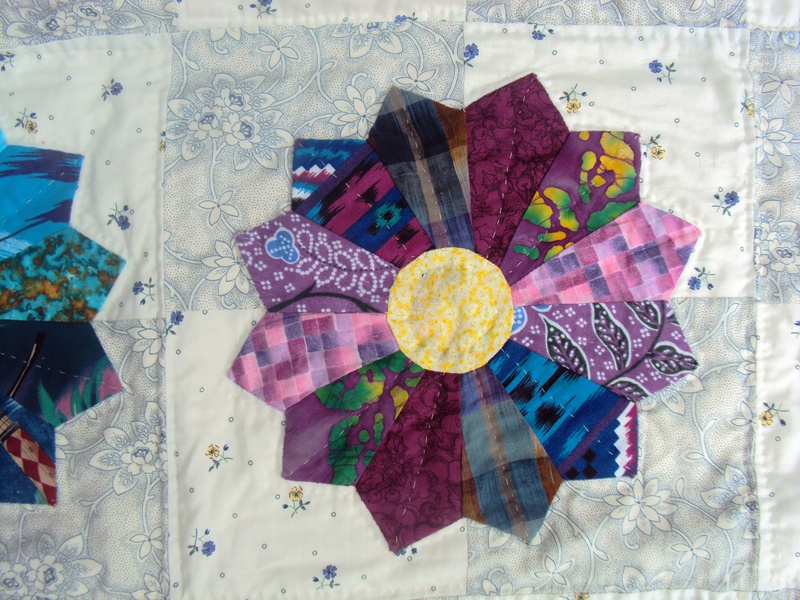 I am participating in a block swap where each of the 20 people in the swap creates same shaped block in in their own fabric, with a different color assigned each month. 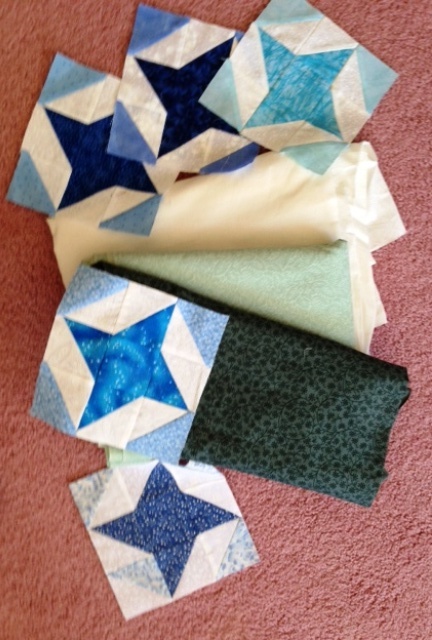 The photo shows a few of the blue blocks, and I have selected the colors for the green swap, which is due the end of August. Eventally we will each have a rainbow of blocks. Fortunately I was nearly finished with another foster child quilt and I had one on hand, so each of the kids will have a new quilt. 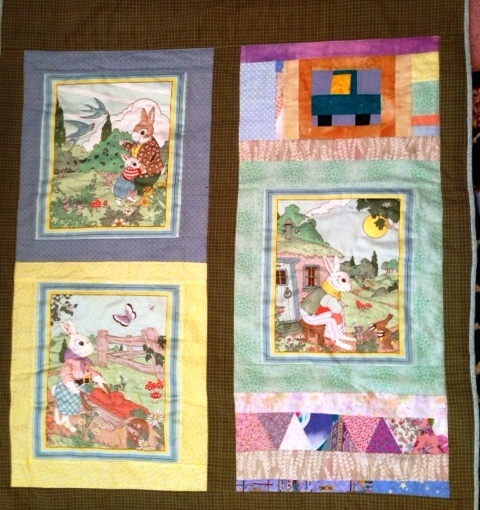 Peter Rabbit quilt I made for our new foster child, I used scraps given byy friends. It was great to take some time for sewing and my family was very cooperative, and now I am ready for the new little ones, come what may!! 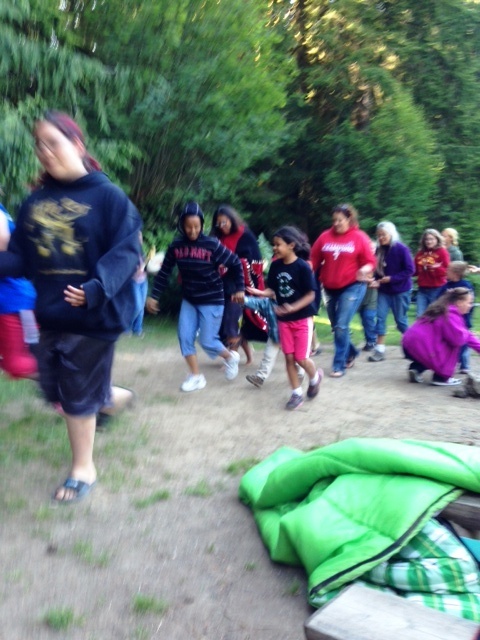 Raven’s had his first experience with a sleep-over camp this week. 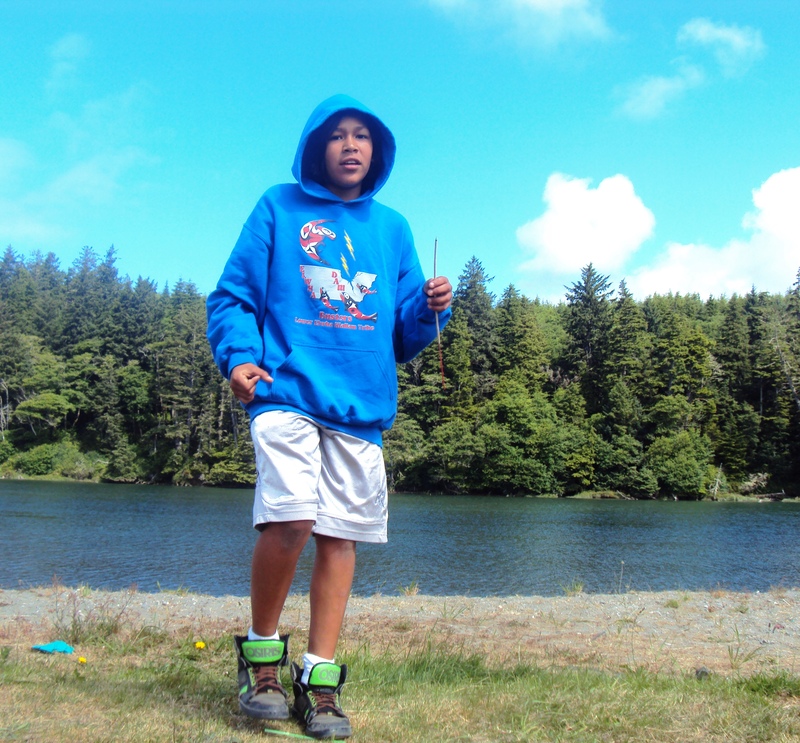 He went with 24 other 6th–9th graders from the Lower Elwha Klallam Tribe to a beautiful spot on Lake Crescent, NatureBridge. 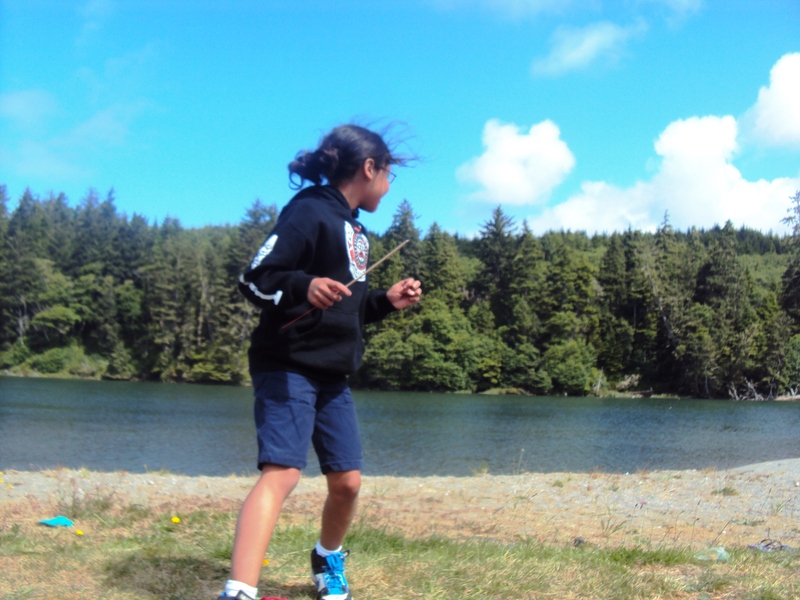 The facility hosts a variety of camps and events and their staff joined with elders and teachers from the Tribe to give the kids an amazing cultural experience. The last night they paddled two huge canoes across the lake and camped. When they returned to camp the last day we were on the shore to greet them along with members of the tribe and the drum group, who welcomed them with a traditional song. 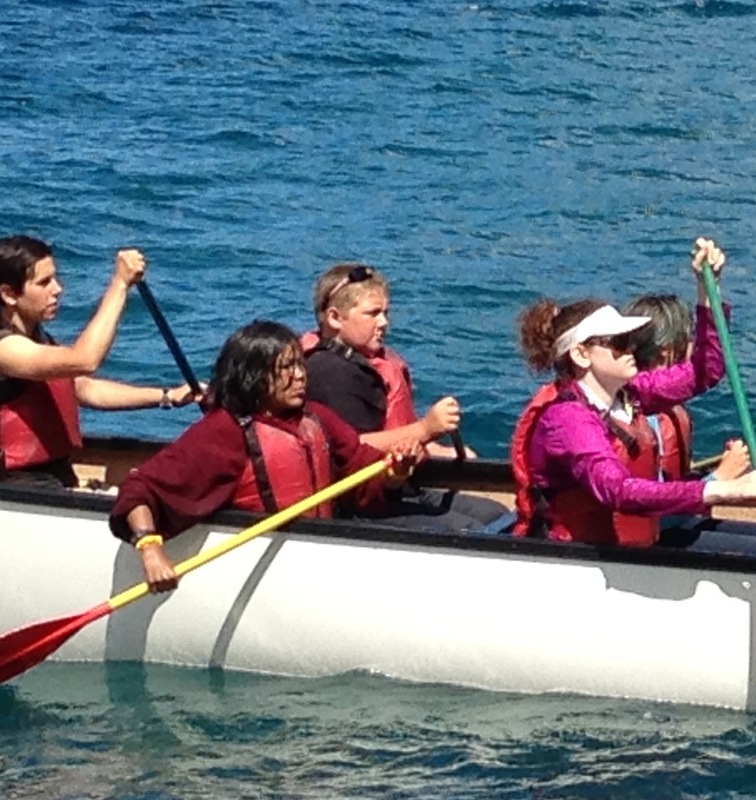 Two of the older girls were “skippers” of the canoes and it was a little surprising to see how well the kids had learned to manage them. It was rough and they were wet from spray but very proud of themselves. 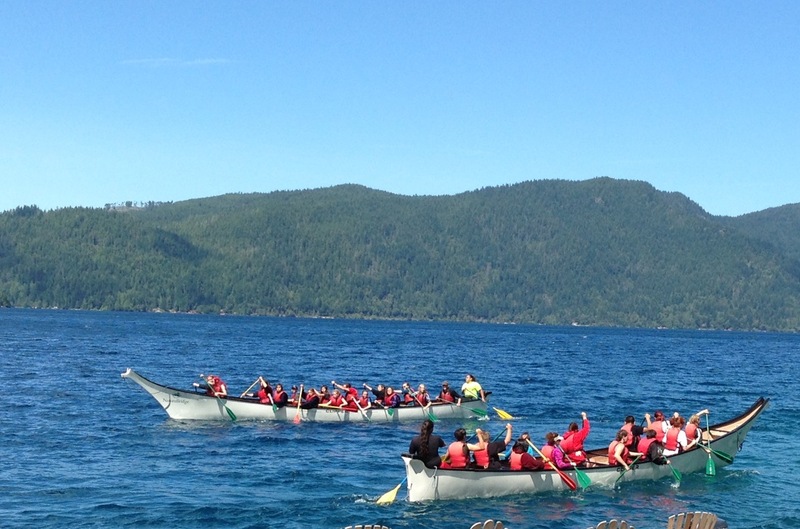 It was a touching experience to see them come to shore while the drummers and singers welcomed them. 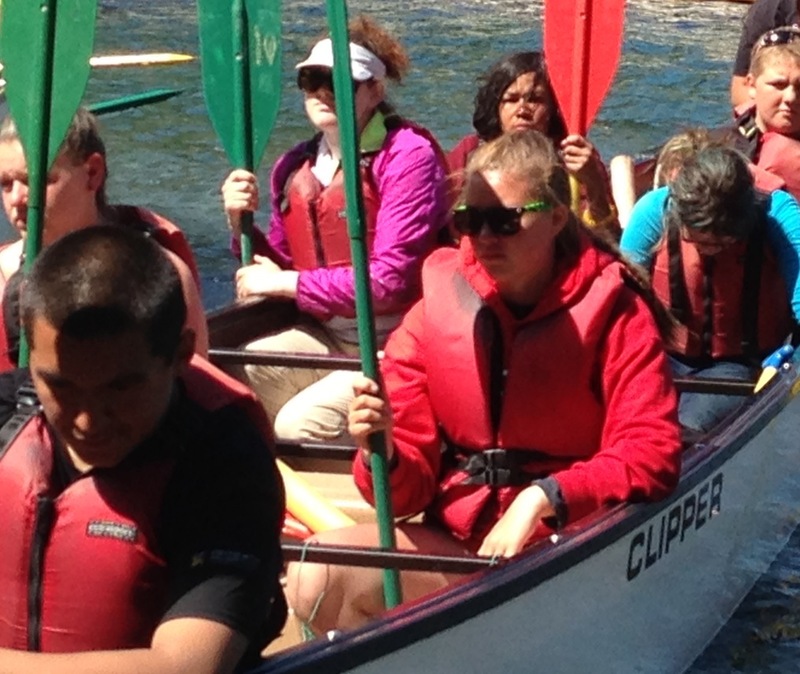 The custom is that the one person from each canoe introduces herself and tells where she is from, then requests permission to come ashore. 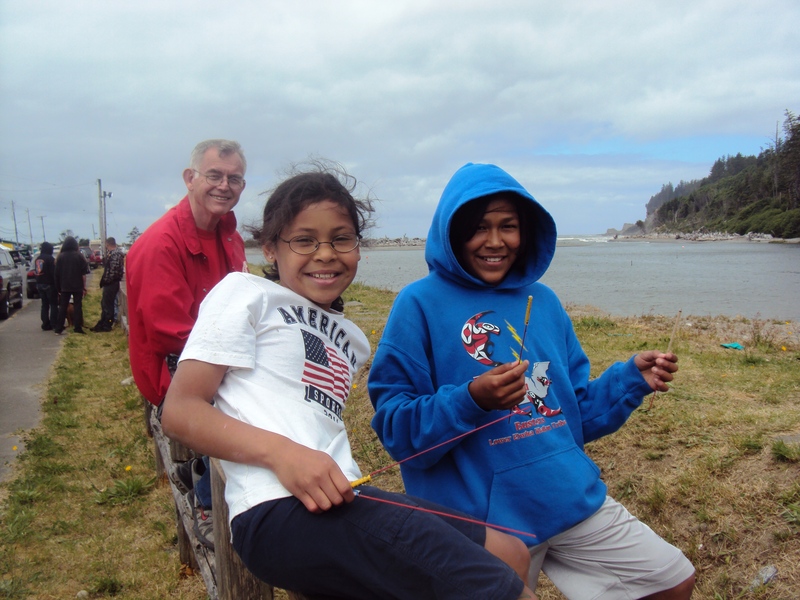 The is done first in the Klallam language, which was nearly extinct a few years ago, then in English. Then the leader ashore responds giving permission. 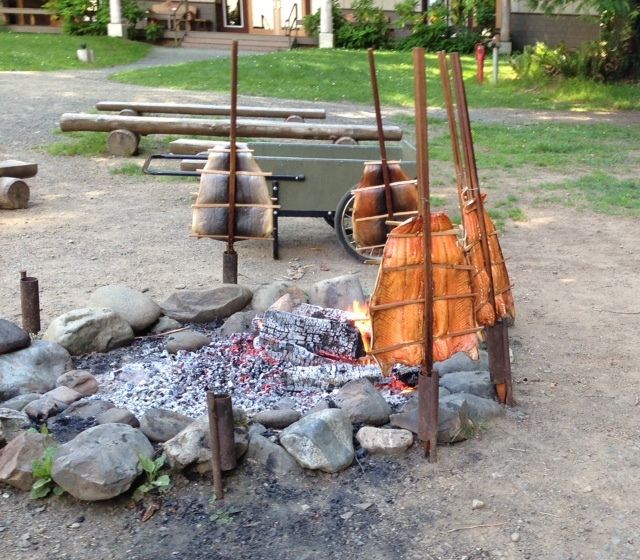 This ceremony was followed by a salmon dinner, with salmon cooked in the traditional style over an open fire. Singing, dancing and drumming followed, with families joining in. Dancing and singing after dinner. Mesky, our daughter in law joined in the fun with Seneca. 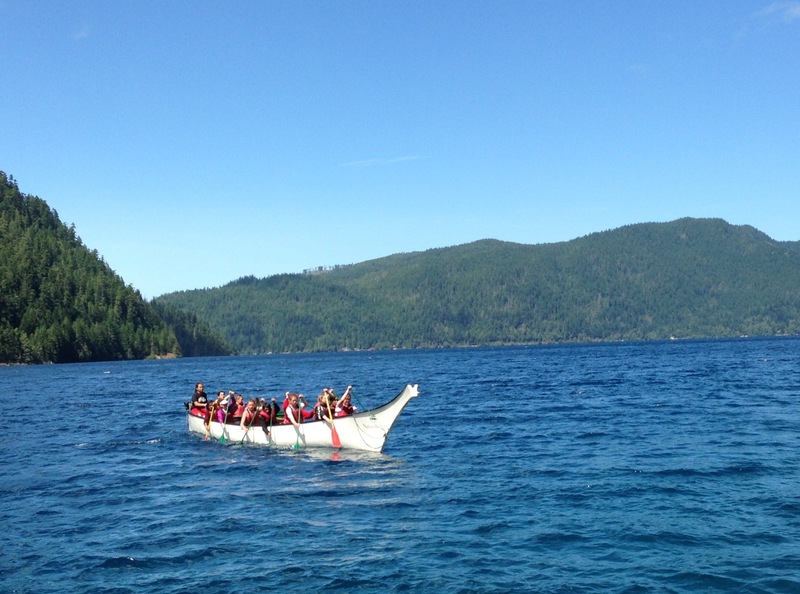 The Canoe Journey will begin in a few days and tribes from along the Pacific Coast from Oregon to Canada will send nearly 100 canoes to the celebration which will take place August 1 to 6 and will be hosted this year by the Quinault Indian Nation. Seneca and Raven will participate in the celebration. We have been working on their regalia–and more will be coming on this subject! 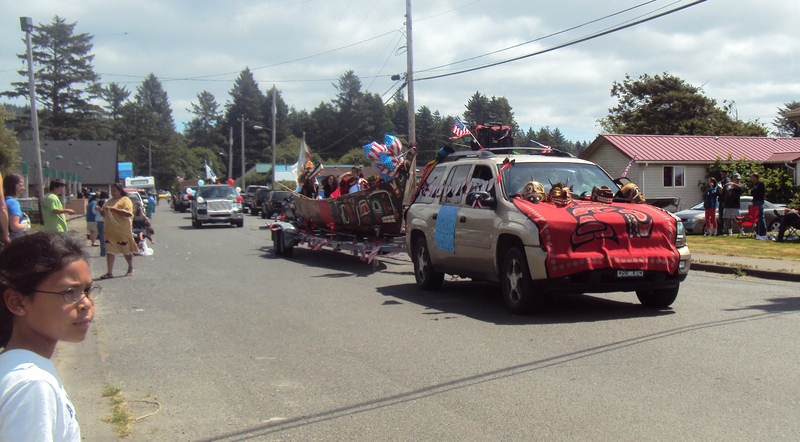 We have developed a family tradition of attending the 4th of July parade at Taholah, a tiny town, about 25 miles north of Ocean Shores. 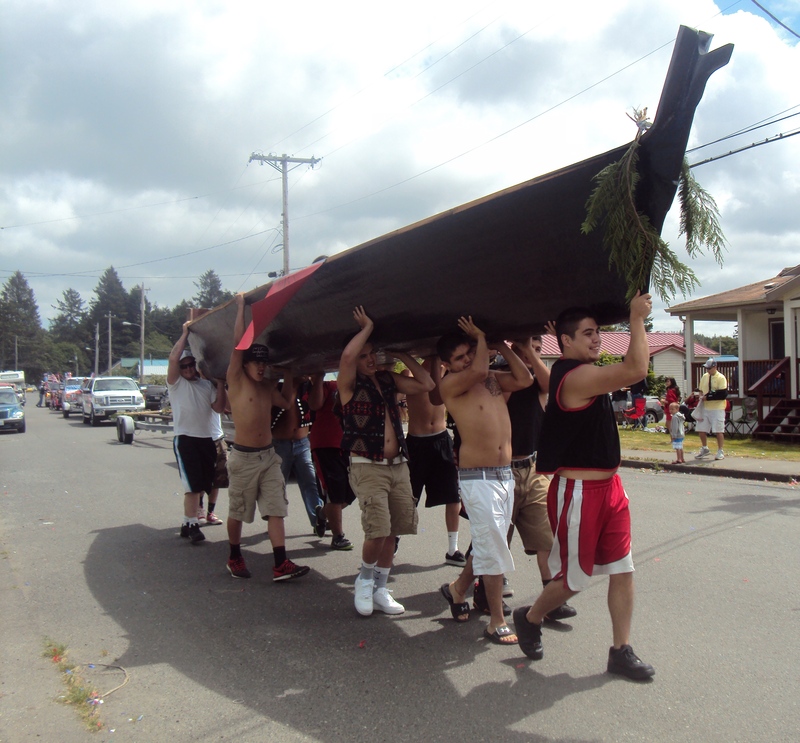 The parade is part of the week long celebration in honor Chief Taholah and the signing of a treaty in 1855. 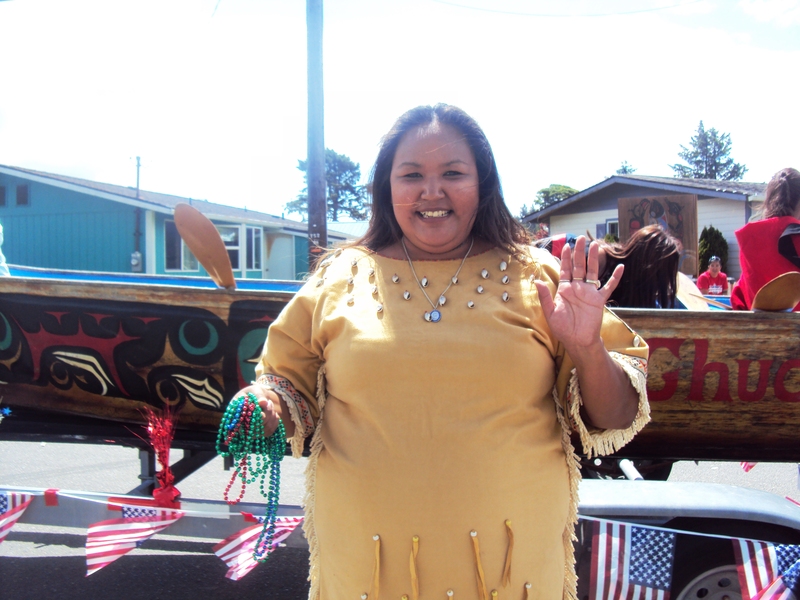 The town, with a population of 850 people, is the seat of government for the Quinault Nation. 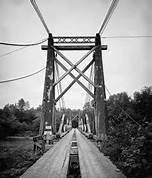 Taholah itself is located at the “end of the road.” The road goes up the beach as far as the Quinault River and basically that is as far as you can go, you must have tribal permission to cross the Chow Chow bridge over the river, if you dare. Small fireworks are allowed on the river bank and Raven and Seneca had a chance to set off smoke bombs and bottle rockets before the parade began. The parade lasts about ten minutes and you never have to worry about getting a good viewing spot. 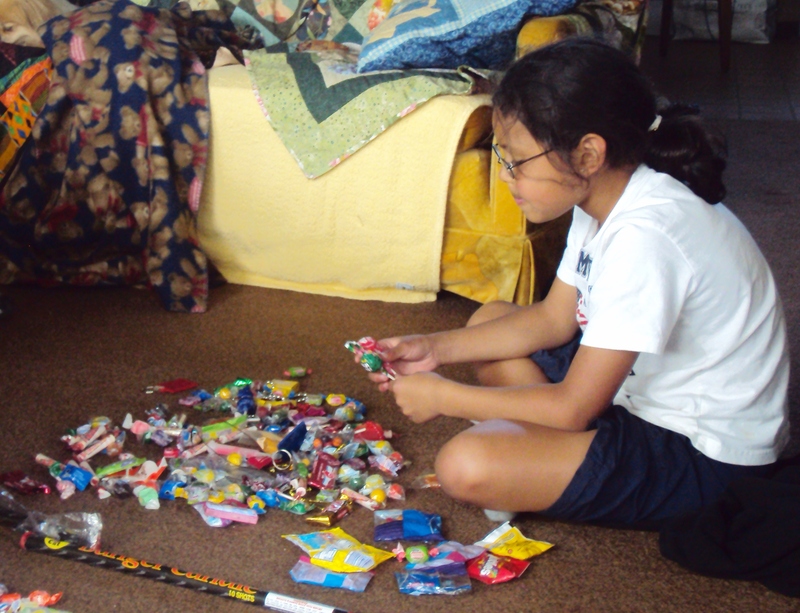 There are no marching bands or baton twirlers, but there are lots of kids and friendly banter and the big draw is CANDY. 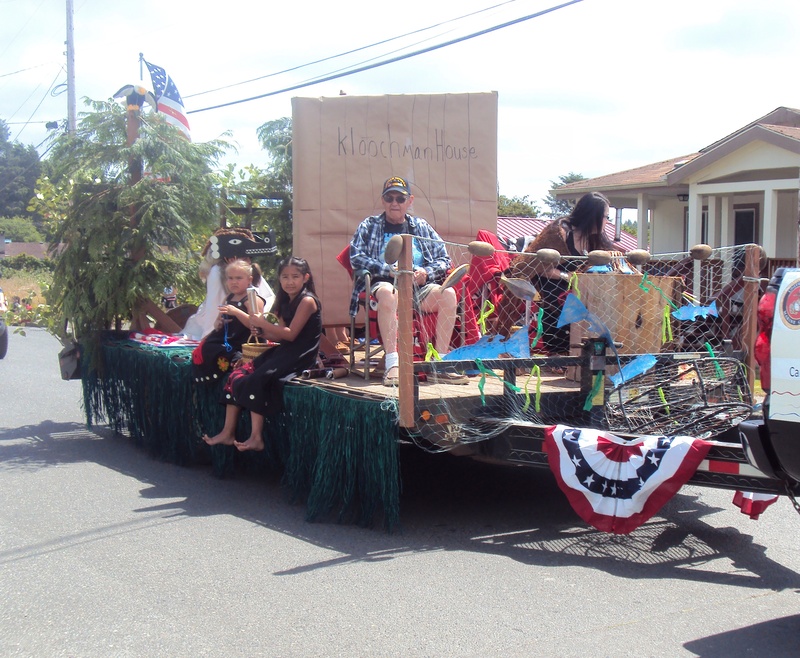 Flatbed trailers are decorated and large wooden canoes are filled with children who throw candy to spectators. 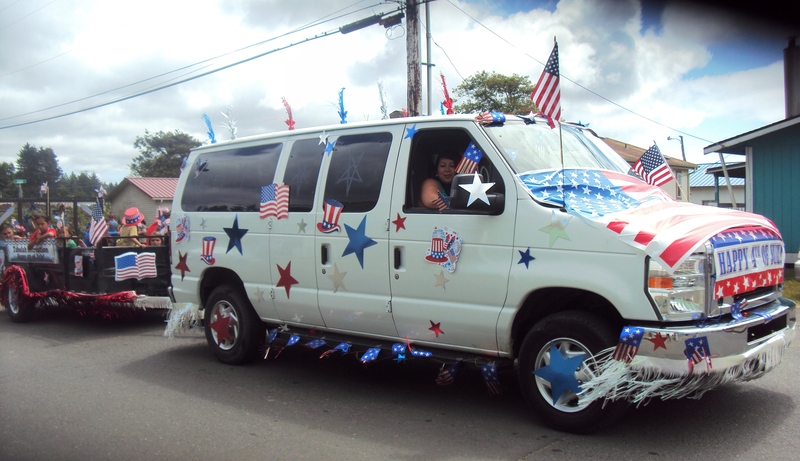 Cars and vans are decorated as well and the local fire engine is always included. 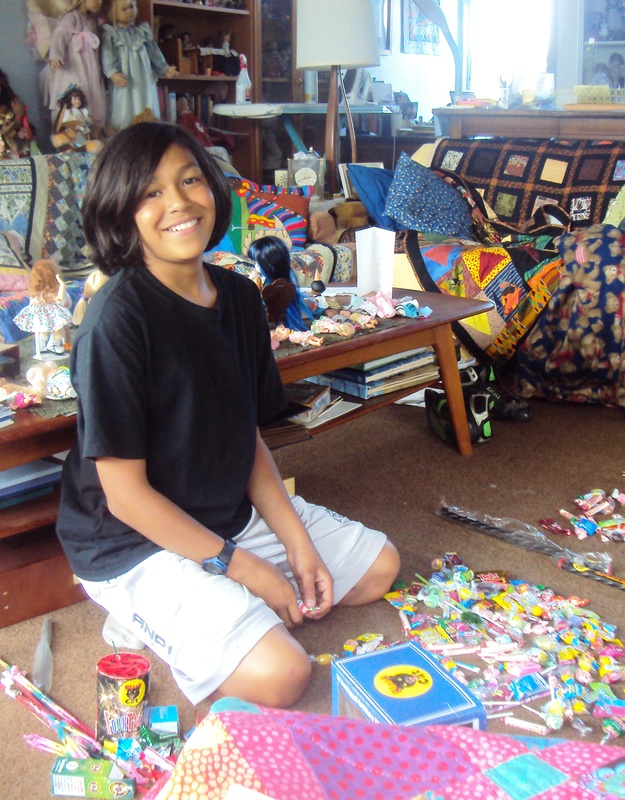 Included in the celebration are a salmon dinner and canoe races, and more but Seneca and Raven are eager to get home to sort their candy. Larger fireworks can be sold but not ignited in the area and we saw collections in boxes selling for $400. The larger explosives can be lit at Ocean Shores and the sky above the beach there was bright with colorful pin pricks of light well into the night last night. Seneca and I watched from the upstairs bedroom while Ted and Raven were at the beach watching up close. 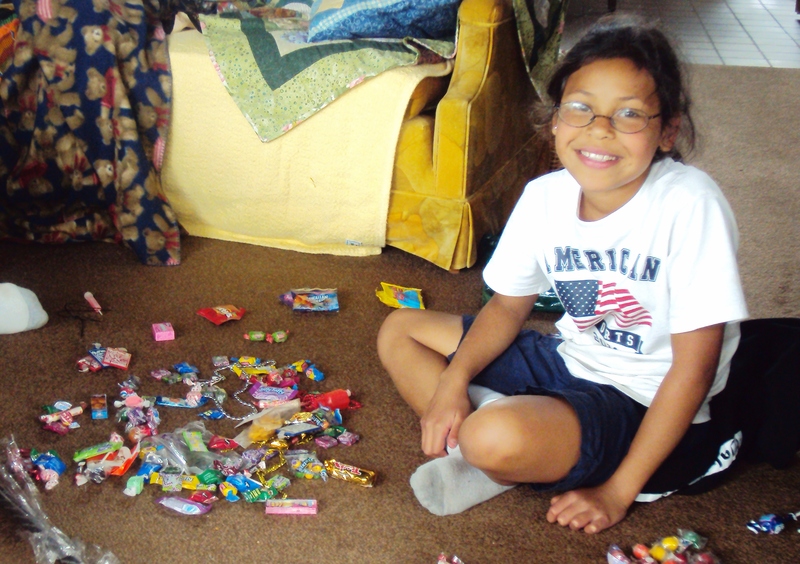 We did ask Raven and Seneca why the 4th of July is celebrated and they could give good school book answers, but for them it was about the candy and the fireworks. I love bright colors and large prints. 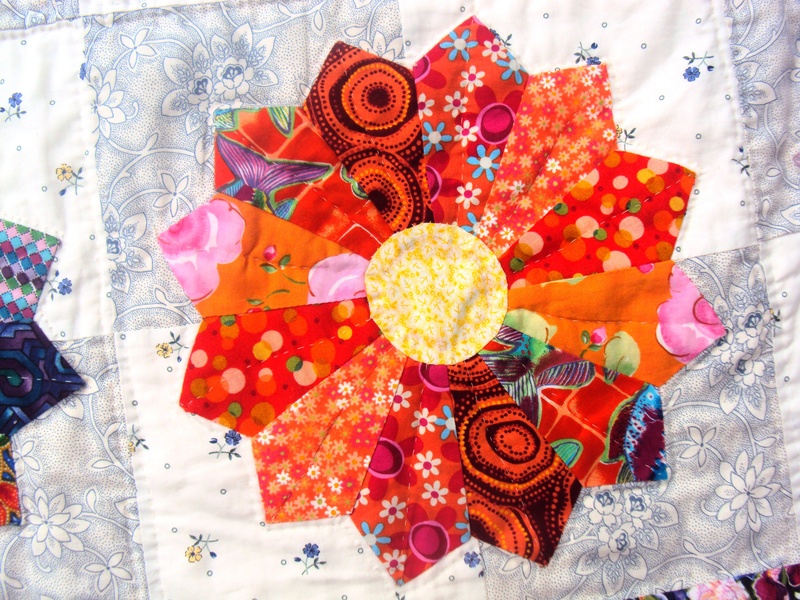 I have many in my collection of fabric scraps and was searching for a pattern that would use a variety of them and result in a quilt that was visually “orderly.” I stumbled on this idea in a quilt magazine and got right to work. That was three summers ago. Now some quilters will start a project and move onto the next before finishing, but not me, I am usually a “finisher.” However, just as I was getting the last of the plates appliquéd onto the backgrounds I broke my arm. It was the upper bone in my arm, actually shattered into many pieces and impossible to cast. I wore a brace and could not quilt. We kept waiting for the bones to knit and though the little breaks did heal the large break refused and finally a year and a half later there was surgery to implant a plate and finally the bone was able to knit. 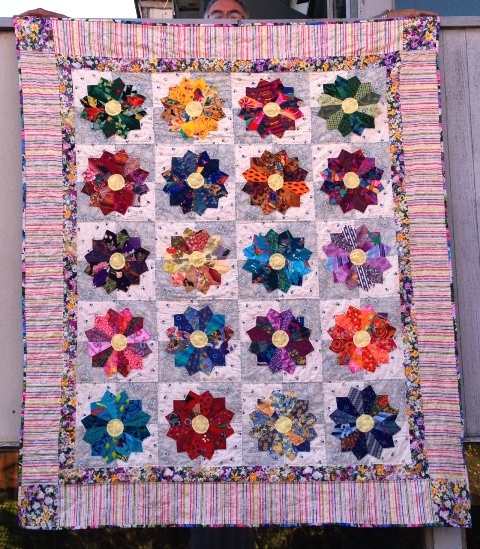 As soon as I was able I finished the quilt top, and I liked it so much I decided to hand quilt it. My hand quilting time is limited these days. Evenings are short as we usually follow the kids to bed. 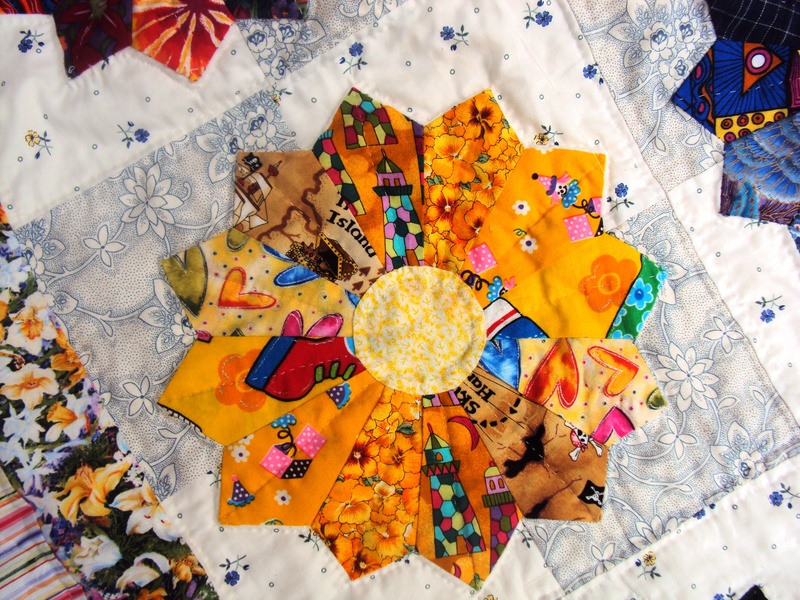 I do find it very relaxing though and though I am not a skilled quilter, I enjoy doing it. Finally this week I finished, put the binding on the quilt and added the label. 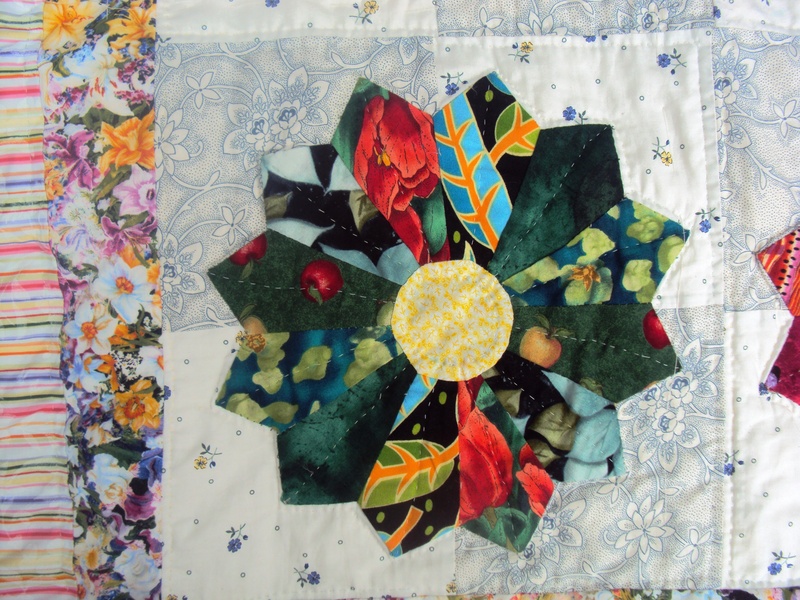 It is now ready to be entered in the quilt show this summer. 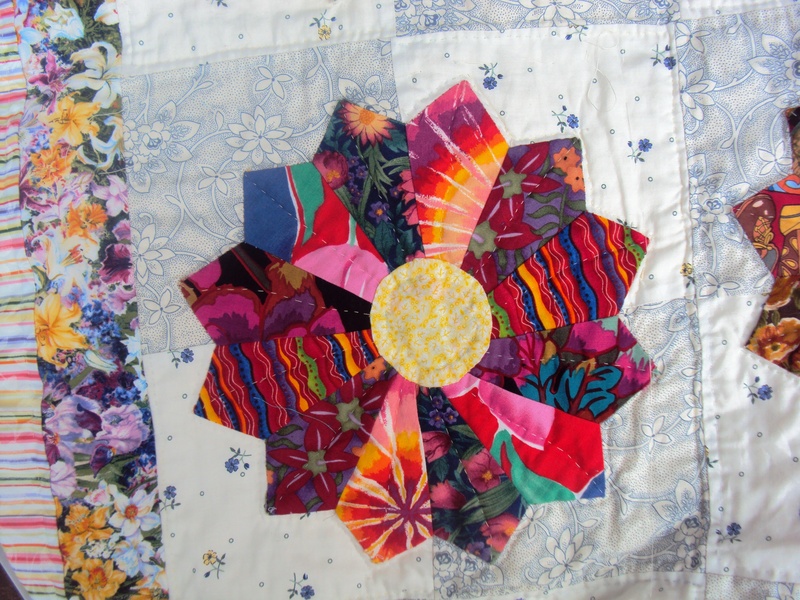 I made some small projects during the three years, wedding, baby and graduation gifts, Christmas gifts, and quilts for foster children, but none required hand quilting. It is so good to have full use of my arm again.